To inspire students to redefine the possible and drive positive change. To discover, prepare, and connect the next generation of entrepreneurial-leaders. 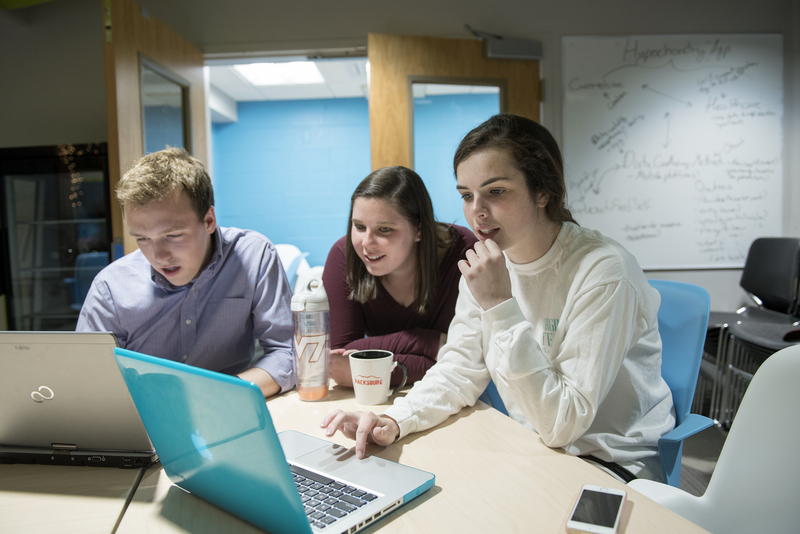 The Innovate Living-Learning community brings together a diverse group of committed and driven students into a high-energy learning environment. We are in search of the most creative, driven and entrepreneurial innovators to come live and create in our community. Innovate will provide an opportunity for students to gain insights into the entrepreneurial process, interact with successful entrepreneurs, and learn from Virginia Tech faculty and community partners. A basic understanding of entrepreneurship, including associated business practices such as strategy, marketing, finance, etc. Exposure to entrepreneurial opportunities available to them in and around the Virginia Tech campus. A network of peer and faculty partnerships that will provide ongoing enhancement to entrepreneurial ventures. In addition, students will have the opportunity to return to Innovate to both continue their own entrepreneurial learning as well as mentor and support incoming students. Entrepreneur-in-Residence – Successful entrepreneurs and business leaders reside in a fully furnished studio apartment within the Innovate Living-Learning Community. With a new EIR every week, a variety of ideas, opportunities, and connections, are fostered by facilitating organized events and close interactions alongside students. Entrepreneur Treks – Students embark on an immersive experience by traveling all over the country to meet and network with start-ups and innovative companies. Treks provide an unprecedented opportunity for students to learn first-hand how their major and interests are applied in business. Venture Garage – A weekly community meet up in Innovate’s own “Venture Lab” dedicated to innovation and professional development. At Venture Garage, the community comes together with help from the Apex Systems Center for Innovation and Entrepreneurship to develop business ventures, work on personal projects, and gain professional skills to help secure a summer internship. Innovate is a program of the Apex Systems Center for Innovation and Entrepreneurship, and is a collaborative venture that includes support from the Pamplin College of Business, the Division of Student Affairs, and a number of departments across campus with interest in engaging with students in the entrepreneurial experience. If accepted, you will become a key part of the broader innovation ecosystem emerging on our campus and the broader community. We are constantly seeking out driven, creative young minds who can positively contribute to our community. Applications are OPEN for new (incoming) students interested in joining Innovate for Fall ’18. (FB: @vtinnovators | Twitter: @innovateVT | SnapChat: @innovatevt | Instagram: @Innovate_VT | YouTube: Innovate at Virginia Tech).